We had a leak a little over a year ago that a handyman said looks like it was leaking on a support beam in the crawlspace. I'd like someone to come take a look at it and see if there are any potential issues. We do have some cracks on the walls as well which I worry may have been due to the leak. Please let me know if it's possible for someone to come take a look. I have 4 concrete slabs in my back patio separated by pieces of wood that have deteriorated over time. One slab has sunk and one is lifting. I can no longer put a table and chairs outside because the ground is no longer level. Looking for a solution, preferably one that isn't too costly. Would like to know cost of earthquake retrofitting our residence. Looking for a written estimate on foundation repair and / or replacement. House foundation isn't level with dips & humps around the kitchen and entry from living room to kitchen. Need it looked at & fixed. Both my husband and I want to thank your company for the excellent job you did on our foundation retrofitting. It was quite a job and everyone involved with your company handled it professionally. At Foundation Repair of CA we put customer service first and are proud to serve our area. Our team of trained technicians use only high quality materials from the best manufacturers in the business to ensure that you get only the best results. If you live in an area that's prone to earthquakes, then don't take chances with your property. Earthquake retrofitting, or seismic retrofitting, is the reinforcing of a house or building so that it is less likely to be damaged or separated from its foundation during an earthquake. At Foundation Repair of CA, we specialize in stabilizing homes and businesses throughout Northern California. With earthquake retrofitting in place, you're less likely to face significant damage when a natural disaster occurs. Foundation problems destroy your Santa Rosa home’s value and can be dangerous. Most of the time what seems like a large problem, actually has a relatively simple solution. When your home suffers from foundation problems, the most frequent cause is weakened, shifting soil that can no longer support the weight of the structure.Our in-house team of structural and geo-technical engineers are here to help. We design and install the right solution and usually have the project finished in less than a week. You will have peace of mind as we provide a 25-year written warranty against defects on our foundation products. PolyLevel® is sometimes mistakenly referred to as slab jacking. This concrete leveling product is a two-part foam engineered to expand immediately upon injection beneath a settled slab. Unlike traditional methods of replacing the entire slab, the PolyLevel® injection site is no bigger than a penny. In action, PolyLevel® expands to many times its original volume, forcing the sunken to the appropriate height so that it's even with the surrounding concrete. Within a matter of minutes, the expanded polymer hardens and reaches 90% or more of its final strength. This process is quicker, easier, and more long-lasting that other traditional methods, not to mention more cost-effective in the long run. Complete the job with NexusPro and SealantPro. 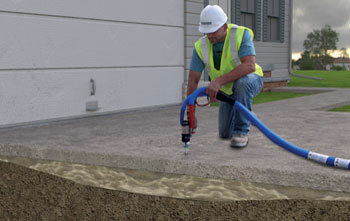 NexusPro is the long-lasting solution for cracks in your concrete. It is durable and flexible, so it can withstand the test of the elements and will never crack or dry out. Defend your concrete against water damage and staining with SealantPro, which forms bonds with your concrete on the molecular level to ensure that your concrete looks brand new for years to come. Universal Foundation Plates installed in crawl space of home. Need estimate for replacement of foundation jacks. We have 6 piers leaning under our house, a small crack in the foundation due to excess dirt in that corner and something else going on with near the front porch. Help?! Looking forward to hearing back, thanks. Uneven settlement of Home is causing front door misalignment and it will not close normally. Problem seems to be getting worse, so I want to see if there is a foundation issue worth addressing. Gap between wall and floor in old (1949) part of house, biggest gap about half an inch. I have a single story home constructed in 1963 that needs the cripple wall reinforced. The mud sills are bolted to the foundation. Our house has cracks in the dry wall, on ceiling and a crack on the outside wall of the house.